The New Breed is FRONTIERS MUSIC's growing stable of young, exciting, up-and-coming bands who represent the future of hard rock and metal. The label is focused on finding and developing new bands from many different territories that will show the world that rock is indeed far from dead. 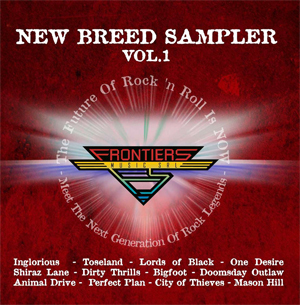 Frontiers has put together a sampler that includes tracks from some of the New Breed bands to whet fans' appetites worldwide for these new signings. A FREE 12 track sampler can be downloaded from the label's website at http:///www.frontiers.it and CD version of the same sampler is available from select New Breed artists' merch booths at current and upcoming gigs. Frontiers' President, Serafino Perugino says "In the past few years, we have been receiving more and more solicitations from new bands whose material has been of the utmost quality and immediately made us stand up and take attention! Like never before have we seen this much young talent surfacing all over the globe. So, we have set off on a journey to rejuvenate the rock scene, trying to find even more of the most exciting new acts in hard rock, metal, and melodic rock. The NEW BREED, as we call them, are artists who will showcase to the fans some of the best new talent in rock 'n roll music! Looking forward to showing everyone out there that Rock Ain't Dead!" GM of US Operations, Nick Tieder, says of the New Breed, "New Breed is a concept we came up with to separate our developing acts from the established artists on the roster. Many of the New Breed bands are certainly influenced by music from the '70s, '80s, and or '90s, but they also have their feet firmly planted in the 21st century. We wanted to make sure fans are aware that not only is Frontiers the home for their favorite artists from yesteryear, but also home to a stable of emerging new talent. We see a TON of comments on social media from fans bemoaning the current state of rock music, seemingly unaware that there is a wealth of great new rock bands not only on Frontiers, but in the genre in general right under their noses. We are on a mission to remedy the perception that rock music is dead. It is quite the opposite, in reality. And within the New Breed talent pool is a lot of diversity. They are running the gamut from modern hard rock to alternative rock to melodic rock to bluesy hard rock and more. The common theme they all share is loud guitars, excellent vocals, pulsating rhythm sections, and superb songwriting. We hope rock fans out there, if they are so inclined, will take the time to download this free sampler and/or check it out on any of the digital streaming services. We're confident you'll not only find something you like, but something you LOVE!